The Florida Panthers ended their home campaign on a sour note, but their next victory will give them their best road record since the club's inaugural season. The Panthers will try for their franchise-best 19th road win when they meet the Atlanta Thrashers on Tuesday in the first contest of a season-ending three-game swing. Florida (36-34-9) made a furious run toward capturing its first postseason berth since 1999-00, winning a season-high seven straight games from March 2-16 to move within two points of the eighth and final Eastern Conference playoff spot. The Panthers, though, have since dropped four of five, and are mired in a three-game losing streak - their longest since a four-game skid from Nov. 7-13. They were mathematically eliminated them from playoff contention with a 3-0 loss to Washington in their home finale on Saturday. "It doesn't feel very good," center Stephen Weiss said. "You play 82 games to make the playoffs, to win the Stanley Cup. You put a lot of effort into it. When you don't make the playoffs, it's very disappointing." Tomas Vokoun made 30 saves for the Panthers, who totaled 32 shots on Saturday, but faltered on all five power-play chances to fall to 0-for-15 in those opportunities over the last three games. They've only scored three goals in that same stretch. Florida finished with 18 wins on its own ice for its fewest home victories since it had 16 in 2003-04. On the road, however, the Panthers have won three of five to improve to 18-19-1 - matching the number of road wins they had during the club's inaugural 1993-94 season. Florida has three games left to try to establish a new record, with the first attempt coming in Atlanta (33-39-8), where it is just 6-10-4 with four ties since Philips Arena opened in September 1999. "We have three games to go. 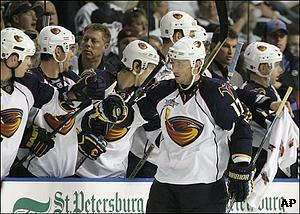 We owe it to ourselves and our fans to play hard," captain Olli Jokinen told the Panthers' official Web site. "It's tough, but we have to show some pride and play for the franchise. We've got to find a way to be motivated." The Panthers had lost 11 straight in Atlanta before winning two consecutive matchups in 2007-08, helping them take a 4-2-1 series edge over the Thrashers. Florida, which last won the season series when it went 3-1-1 in 2002-03, meets Atlanta for the second time in six days after a 3-2 loss on Thursday. Atlanta, with the second-worst record in the East, concluded its three-game road trip with a 2-0 victory over Tampa Bay on Monday. Ilya Kovalchuk scored two third-period goals, while Kari Lehtonen stopped 36 shots for his fourth shutout of the season - and 11th of his career - for the Thrashers, who have won just twice in eight games. Kovalchuk, who had 11 goals and five assists in 14 games in March, has been the lone bright spot in Atlanta's dismal season. "I just want to forget (the season) like a bad dream," said Kovalchuk, who is second in the NHL with 52 goals, matching the career high he set in 2005-06. Kovalchuk has seven goals and five assists in seven games against Florida this season. In 37 all-time meetings, he has 24 goals and 49 points - his most against any opponent. Lehtonen, who made 43 saves in Thursday's win, is 1-1-2 with a 2.66 goals-against average in four starts against Florida this season. However, he is 7-1-1 with two shutouts and a 2.08 GAA in nine career home meetings versus the Panthers.